Christie’s devotion to helping animals is as strong today as it ever has been. She attributes her lifetime passion of helping animals to a neighbor. When she was a young girl, her neighbor allowed Christie to follow her around watching her treat and care for her many cats and horses. 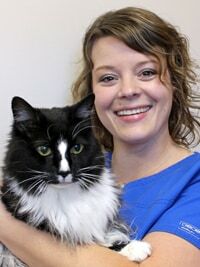 Christie is a graduate of the Maple Woods Veterinary Technician program. Upon graduating from the technician program, she worked locally before joining Ark in 1996. She is truly grateful to be a part of such an amazing team here and enjoys the variety that comes with this profession. When you need help Christie’s training and experience can be counted on to get your loved ones back to health. She is a vital extension of the total team approach to your pet’s care. Christie is a lifelong Kansas City resident. When not at work, Christie enjoys spending time with friends and family, photography and traveling. Christie found her cat Gilligan just outside her house. Gilligan begrudgingly shares his space with Skylar, a Poodle mix. Christie cannot imagine not being greeted by these characters when she arrives home. Jamie grew up with a love and respect for all animals. She spent her childhood traveling the United States, where she developed a fascination for those animals she encountered along her journeys. That fascination inspired her to volunteer at equestrian farms, rehabilitation shelters, as well as the World Aquarium of St. Louis. As the years passed, she realized she wanted to make a career out of helping animals. In 2011 Jamie graduated with honors from the Veterinary Technology Institute at Hickey College of St. Louis, MO, and completed a three month long veterinary technician internship at John G. Shedd Aquarium in Chicago. After moving back home to St. Louis, Jamie started her career with a local veterinarian’s office and became a registered technician shortly after. Life changes took her to Liberty, and she joined Ark’s medical staff in 2015. Along with her love for aquatic and exotic animals, Jamie is very passionate about pet behavior and physical rehabilitation. She is currently attending the Canine Rehabilitation Institute with the hopes of becoming a certified canine rehabilitation assistant. She looks forward to contributing to our already excellent level of care at Ark. Jamie and her husband both suffer from wanderlust, and share a love for camping and fishing. You will often find them in the Ozarks arguing over who caught the biggest trout, or catch them restoring their vintage pop-up camper. They also like to travel internationally, and so far have checked Costa Rica and Ireland off of their bucket lists. Jamie has a lovable mutt named Lola, an excitable beagle/Chihuahua mix named Remi, and a sassy, accident prone cat named Buck. Lola and Remi love to come to dayschool at Ark, Lola’s the funny brindle one barking at everyone and Remi is the little one with long legs running after her! Buck prefers to stay home and watch his birdfeeders outside of his window, and he will sit and shake for treats. They make quite a trio, and Jamie can’t imagine life without them! Holly always knew growing up that she wanted to work with animals. Originally she thought she would be a groomer, but after several failed haircuts on her Barbies she decided to abandon that plan. She spent a lot of time at her neighbor’s house playing in the barn with all the resident barn cats. Whenever one of them had any sort of problem, she always wanted to bring it home with her and “make it all better.” That was when her passion for helping and healing animals started to take root. It wasn’t until years later she found out what a veterinary technician did. She decided that was absolutely what she wanted to do the rest of her life. Holly graduated from Maple Woods Veterinary Technology Program and is now a Registered Veterinary Technician. Holly brought new ideas and a fresh outlook to the experienced Ark team in 2012. If you need a routine visit or have a friend that needs help, Holly can help. She enjoys every aspect of her job, with particular interests in cardiac and abdominal ultrasound, surgery and dental procedures. She has the training to enrich an animal’s life, and approaches her job with the same tender loving care she began giving as a child. Holly grew up in east Independence on eight acres. Holly had just about every farm animal that you could think of, ranging from guinea pigs and fish, to cattle and pot-belly pigs. She now lives in Lee’s Summit with her husband. In her free time she enjoys reading, watching a wide variety of movies and television shows, and spending time with her family. Holly has two cats and one dog. Hank and Minnie were found when they were just days old. She worked tirelessly to nurse the kittens to health, waking up every three hours to bottle feed them. Millie is a hound and Doberman pinscher mix who is incredibly silly and loves coming to dayschool. Holly loves knowing that she can come home and her kitties and dog are there for her to hug and snuggle until everything is better. Even as a young child, Anna knew that she wanted to work with animals. She grew up on a farm that included cattle, horses, pigs, goats, chickens, and many barn cats. Her mission as a child was to tame all the barn cats and give them all names. Her passion for animals led Anna to the veterinary field in 2007. 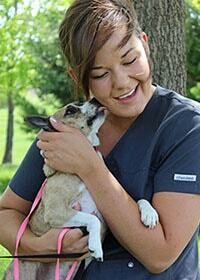 Anna attended Maple Woods Community College and graduated with a degree in veterinary technology. Anna began her career at Ark Animal Hospital as a registered veterinary technician in 2015. Since joining the team at Ark, Anna has developed a special interest in canine physical rehabilitation, as well as continued interests in emergency medicine and wellness care. You will often find her in our rehabilitation room, leading dogs through strengthening exercises and managing the underwater treadmill. At home, Anna has a cute guinea pig named Finn. Finn loves to eat yogurt treats and bananas. In her free time, Anna enjoys spending time with her family, fishing, and working on classic cars. Shannon has always loved animals, and growing up her family always included a pet or two. After getting a job working at an animal hospital as a teenager, she knew being a veterinary technician was for her. Shannon gained experience as a veterinary assistant while going to Maple Woods Community College. Through their Veterinary Technology program, she received her degree and was able to take the national and state examinations to become a registered veterinary technician in 2010. As an RVT, she is responsible for caring for the patients and communicating with pet parents. She spends a lot of her time working with the pets here for surgery and dentistry. 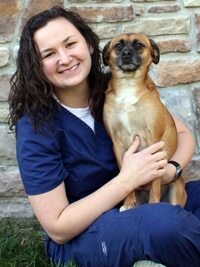 She has a passion for senior pets as well as pain management. 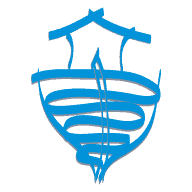 Shannon has dedicated many hours of continuing education to learn about pet pain and its management. At home, Shannon has three rescued pets. She has one cat named Mrs. Chubbins, a one-eyed cat who is on a life-long diet. She also has two older dogs named Carter and Beatrice who are her best friends. Carter joins Shannon at work to receive physical rehabilitation and is a model patient. Beatrice is a cancer survivor who loves lazy days at home and following Shannon around the house. Outside of work, Shannon enjoys reading, playing volleyball, and spending time with family. Shannon is the president of the Kansas City Registered Technician Association, and devotes extra time to helping other technicians learn and grow as well as promoting the veterinary technician career. Jamie W has always had a love for animals big and small! Her love for animals started when she came home from the hospital as a newborn to her first best friend, Tommy Two-Tone (Tom). Tom was a rather plump cat that enjoyed patrolling the neighborhoods that he lived in and keeping watch over newborn Jamie. Tom passed away when she was five years old, and she couldn’t understand why Tom was on this Earth for such a short time. Ever since then, she has wanted to help cats live longer, healthier lives. Jamie decided to pursue an education in veterinary technology during her senior year of high school after learning about the profession and discovering the program at Maple Woods Community College. Jamie worked as a veterinary assistant while attending Maple Woods. After receiving her Associate’s in Applied Science-Veterinary Technology, Jamie joined the Ark Animal Hospital team as a veterinary technician. She passed her national and state examinations shortly thereafter to become a registered veterinary technician in 2016. As an RVT, Jamie is responsible for taking care of patients, obtaining diagnostic images and laboratory samples, and assisting the doctors throughout the day. She has not chosen a special area of interest yet, so she spends her days working with the doctors and other technicians to learn as much as possible. She does have a particular passion for our feline friends, though! Jamie has two cats at home, Boots and Ozzy Ospurrne. Ozzy also “graduated” from the Maple Woods Veterinary Technology program in December of 2015, where he learned to “sit,” “high-five,” and walk on a leash. Jamie was partnered with Ozzy for the fall semester and she decided to adopt him within the first week. Outside of work, Jamie enjoys painting, reading, baking, and watching medical or crime-solving TV shows. She also makes an effort to go back to Lawson once a week to visit her parents and maintain the long distance friendship she has with her very special senior dog, Casper, who she inherited from her late grandpa in 2014. They enjoy going for long walks around Lawson and Lawson Lake together. Rachel’s love of animals started with a trip to Sea World as a child. Instantly she wanted to become a dolphin trainer. Throughout the years, she changed her mind to a veterinarian, a marine biologist, and even an Egyptian scientist! After high school, Rachel started work at a veterinary hospital and finally decided that becoming a veterinary technician is what her heart was set on. Rachel is proud of her husband Eric who is in the Marine Corps. His career meant they were able to see a lot of new places and she was able to experience several different veterinary hospitals in the process! Before getting settled in Kansas City, Rachel earned her Associates of Science degree and completed her veterinary technician degree in 2015 while living in Muscatine, Iowa. In 2016, Rachel moved to the area and started work at a local animal hospital. She had a special interest in surgery (especially orthopedics) and animal behavior, which brought her to Ark in July of 2017! Rachel is excited to begin training in ultrasonography as well. Rachel and her husband Eric have two children, Harlie and Hunter. They are joined in the house with 3 dogs, Chloe, Trapper, and Kinnick, and 2 cats, Bailey and Cheerio. There is never a dull moment in this very full home! Jessie grew up with a love of all animals. Her childhood home had pets, including a crazy cat, pocket pets, fish and always a Labrador retriever or two. She always wanted to work with animals. Her love of animals eventually led her to earn a Bachelor’s degree in biology from Truman State University. During her time at college, she studied animal behavior, physiology and even completed a large game capture and conservation class in South Africa. After moving to Liberty after college, Jessie continued her training by working with a veterinarian. Jessie joined Ark’s medical staff in 2007. To give you and your pet the attention you need, Jessie is a highly trained extension of the doctors. For you to understand how your pet can be helped the most she is an excellent client educator. To provide painless, noninvasive diagnostics for your pet she has devoted hours of continuing education to enhance Ark’s diagnostic ultrasound capabilities. Jessie’s husband Tony is a high school engineering teacher. Jessie and Tony have one young son, Quinn, who makes them smile and laugh every day. In any free time Jessie has that is not spent with her husband and playing with her son, she loves to read, game, and dabble in writing, drawing and photography. Jessie has five (yes, five!) cats at home. Jessie and her husband bottle-fed and hand raised littermates Coal, Onyx and Ember. Coal is the handsome boy who is always on the lookout to steal any food left out. Onyx is the family’s ‘dog-cat’ who loves belly rubs. Ember is a cuddlier who loves to fetch hair ties. Tali was adopted from a shelter, and she is the resident queen of the universe. Moe is also a rescue, and while he is not the brightest crayon in the box, he does love everyone. Without them life would be less interesting and laps would be cold. Claire’s hand on experience and passion for animals of all kinds continues to grow every day. Her passion began at a very young age. Her family was always telling her that she had a special connection with animals, being able to get any animal to come up to her. Claire really got into caring for animals growing up on her family’s farm. Claire would fearlessly follow her grandfather around the farm, doing chores and caring for all the animals they had or that would pass through. She was constantly concerned with the well-being of all her beloved pets, domesticated or not. Claire loved improving the lives of the animals she met, even if it was just extending a trusting hand so the animals wouldn’t be scared. Claire hopes to improve the lives of all the animals and pet parents she encounters. After graduating high school, Claire immersed herself in the world of pets. She has had jobs that include taking care of dogs, cats, horses, reptiles, and birds. Since then Claire has moved to the area and joined Ark in July 2018. She hopes her experience here will help her with her future goal to be a veterinary technician. Her goal in life is to become a registered veterinary technician, with focuses on large animals and behavior. You can find Claire in all areas of Ark: helping hold pets for exams, assisting in set up and cleanup of surgery, caring for all the patients in recovery, or helping out in kennels. Overall when there is an opportunity to learn or help, Claire is there asking questions and getting as much experience as she can. Claire is not afraid to get her hands dirty and enjoys anatomy, physiology, and behavior, as well as causation and effects of different diseases and behaviors and how to treat them if at all possible. Although Claire loves all animals she is partial to dogs. She currently has three that she considers her children. Claire is very dedicated to informing people about some of the positive characteristics of Pit Bulls and trying to help to reduce some of the negative stigma present. She holds her dogs to the highest standard of good behavior and is very proud of how far her dogs have come. Claire rescued all of her pets from abusive situations and has worked with them tirelessly to improve their lives. Claire couldn’t imagine life without her dogs; they are her whole world. Melanie was known for bringing home stray animals as a child, always wanting to care for them and give them all homes. Growing up she had a Great Dane named Dee Dee, a Poodle named Pepper, a Doberman named Dobie and a beautiful white cat named Sugar. To make your visit as easy as possible, Melanie is there to schedule an appointment, keep vital health records up to date and find the answer to any question. 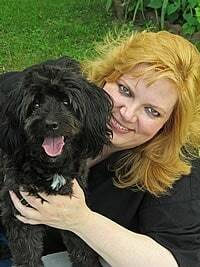 Melanie strives to give all clients peace of mind and keep all pets happy. Melanie is very close to her family so spending time with them is important to her. She enjoys baseball games, disc golf, camping, going to the city market, eating local cuisine and traveling. Melanie is currently undergoing a healthy life change, which includes rigorous workouts and healthy eating. Melanie has been married to her highschool sweetheart for many years. They are the proud parents of two sons. Melanie has a boxer named Freya. Melanie loves Freya’s expressive ears, big brown eyes and her silly personality. If there was not a pet in Melanie’s life, she would miss the unconditional love and acceptance that a pet gives. Jenna has been an animal lover for as long as she can remember. Her childhood home was always filled with pets. Ducks, turtles and rabbits joined the dogs and cats on her own little farm. Since the age of 18, Jenna has been working in a veterinary clinic. She worked in central Illinois until a few years ago, moving to the Kansas City area for her husband’s job. Jenna handles the care and comfort of the pets here boarding or playing in dayschool as well as being an integral part of our receptionist team. Her favorite part of being a part of the team at Ark is dayschool, playing with the dogs, and watching the puppies grow! She is sure to be the one to give extra pets and love to all the pets staying with us, treating each animal as a member of her family. She is also our super cleaner, taking pride in keeping our facility clean and welcoming. Jenna is married to Gavin, and they have a wonderful daughter named Bristol. They love spending time together and with extended family. In her free time, Jenna loves traveling, fishing, baking, and going to water parks. They also share their home with two dogs and two cats, who Jenna calls her four legged kids. Hank is a German Shepherd mixed dog with a heart of gold. Minnie is a rat terrier mix, and although she is small, she is definitely the boss! Cash and George are the feline members of the family, and love to play and cuddle. Her life would be boring without her crazy fur kids to keep her on her toes! Dana played veterinarian as a child. She transformed the bathroom into an exam room complete with a sign “The Doctor is In”. Dana showed love and compassion to all animals by taking in injured and orphaned puppies, kittens, birds, turtles, squirrels and bunnies, caring for them till they could return to normal life activities. Dana received her associate’s degree from Maple Woods Community College. She worked her way up from kennel attendant to receptionist and Financial Services Manager. She has also completed the requirements to participate in Delta Society and R.E.A.D. programs. This allows her to visit people in care facilities and encourage children with their reading. If you need anything, Dana is ready with a servant’s heart. She is involved with all areas at Ark. 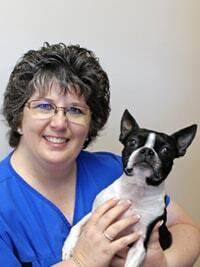 She enjoys working with a team of like-minded individuals that want the very best for their own pets and clients pets. She wants to make a difference in each pet’s life. It is her deepest desire to educate others in how to better the life of God’s creatures. She enjoys spending time with friends and family, fellowshipping at Avondale Baptist Church, singing in the choir, and leading music at City Union Mission. Other interests include Rodeo, fishing/boating, outdoor work and traveling. Dana Shares her home with Clawdia, Gracie, Tom and Jerry. Clawdia is a three legged cat that has personality plus, enjoys the screened in porch and wrestling with her 4 legged family members. Gracie is a vibrant Boston Terrier that enjoys day care at Ark with her Bff’s and road trips. Tom and Jerry were born here at the clinic and bring lots of joy to Dana’s life. Brianna has been surrounded by loving pets her whole life, and has a great deal of love and affection for animals. Growing up in Kirkland, Washington, she helped take care of the family Cocker Spaniel, Winston, and a variety of hamsters. Always with a big heart, she sometimes arrived home after school carrying a cage with the class guinea pig in it (forgetting to ask her mother first.) She loved going to horse camps every summer, where she rode the horses as well as groomed and fed them. Since her life has taken her to Liberty, Missouri, she is now in a busy household with many animals including two mastiffs who sing to her each morning (asking her not to leave), a corgi mix, two cats, a snake and three bearded dragons. Brianna loves caring for the pets at Ark, whether being boarded or in day school, feeding, giving baths, cutting toenails, and playing with them, making sure they are comfortable and happy. As a new part of the receptionist team, she is learning how to help things run smoothly, greeting and checking in pets. Brianna is thrilled to be a part of Ark Animal Hospital, and is excited to pursue veterinary technician school and making the care of animals her life work.